This action type allows you to include other FinalBuilder projects in your project. This allows you to modularise your project by including subprojects, as an alternative to using many Action Lists. Specify the project file to include. Normally, the Main Action List of the included project will be run. This combo box allows you to specify a different action list to run. Note that Action List Parameters cannot be set. The "Reload Environment Variables" forces FinalBuilder to reload the environment variables before executing the included project, environment variables are usually only loaded at startup. If the "Share Host project Variables Namespace" option is checked, then the host project and the Included project will share one variable namespace. This option should be used with caution. When the included project is executed, any project variables of the included project are loaded at that time. If there are variable name clashes then the existing project variable of the host project will be kept. This can lead to unexpected results. When this option is not enabled, the host and the included projects each have their own variable namespace. If the variables namespace is not shared, it is possible to define individual variables to set in the included project. These can be used similarly to Action List Parameters. 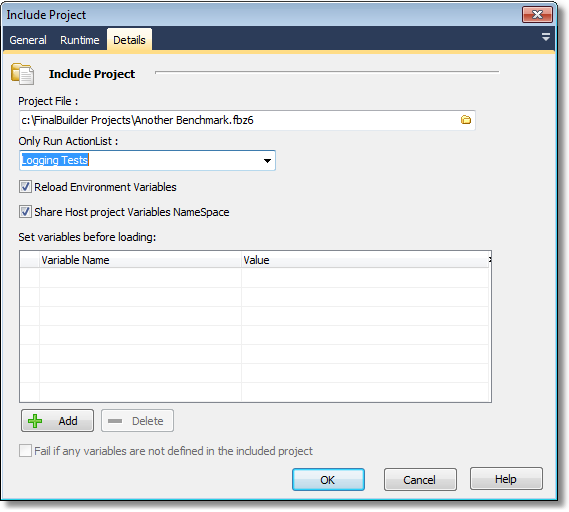 Specify the name of any variables in the included project, and the values to set them to. Note that if the values reference any variables, these are variables from the parent project namespace, not the included project namespace. If this option is set, the action will fail if any variables to be set do not exist in the included project. Otherwise, a warning will be shown but the project will execute.